Katchafire, one of the few reggae bands from New Zealand, just recently released their fourth full-length album, titled “On the Road Again”. Forming in 1997, they began as a Bob Marley cover band, getting their name from the Bob Marley album “Catch a Fire”. Their new album was inspired by their recent touring and embodies that slow mellow sound that we have come to expect from Katchafire. Although there have been several roster changes throughout the life of the band, there have been no significant changes made to their music. “On the Road Again” was reminiscent of their previous release, although not in a repetitive way. This album brings something new and fresh to the table, while still remaining true to their musical roots. The album starts off slow with the first track “On the Road Again.” While the track held a smooth reggae melody, there were also a few short guitar solos as well, which I found to be refreshing. These short interludes, I thought, really made the song great because they brought something different to a slow going reggae song that was quite unexpected. Skipping down the track list a bit, the heightened pace of “Lead Us” makes for something different than any of the previous songs. Aside from maybe one or two other songs, “Lead Us” is the only one to break out of the slow and laid back melodies of the rest of the album. That is not to say, however, that the leisurely tempo of the rest of “On the Road Again” is in any way worse than that of “Lead Us.” One of my favorite tracks, “Chances Are,” gets back into the flowing reggae rhythm that Katchafire is so well known for. With this album they were able to work similar musical elements into each song without boring the listener, a rare feat in the music world today. 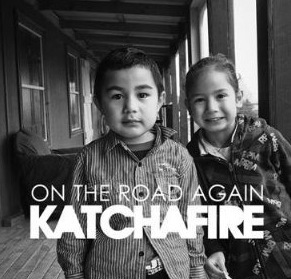 Katchafire’s new release “On the Road Again” definitely lived up to the lofty expectations I had at the start. They switched up the pace of a few songs, keeping the listener on their toes throughout the album. I, without hesitation, would recommend this to any fan of reggae or even someone just looking for some new music. Either way, it is a must have new release.